Before Harry was demanding (and I do mean demanding, not requesting) to use his talker whenever he had something to say and was initiating communication. Before his talker was a permanent part of the paraphernalia that we cart around everywhere. Before any of that, we had to instil one simple habit. Take his voice with us everywhere. The first task that we were given by H’s speechie was to carry the PODD book around everywhere for the first couple of weeks and not to pressure ourselves into using it. Just get into the habit of taking it everywhere with you, she said. It was an A4 sized book with a big spiral binder and at least half an inch thick, so it was a sizeable piece of kit. But it was so much more than just a chunky spiral bound book. 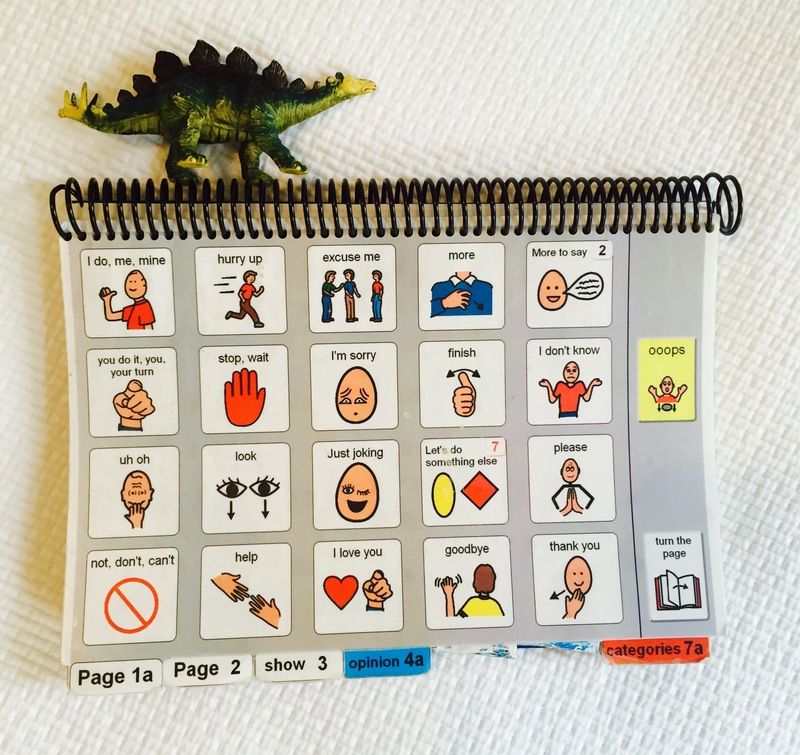 Harry’s first PODD communication book showing 20 symbols on the front page and a plastic dinosaur toy for scale! Within its colourful symbol-filled pages lay the possibility of real communication, of Harry being able to tell us so much more than what he wants to eat or whether he wants to play with blocks or cars. It held the symbol for “I love you”! Just carry it around and don’t stress about using it, she said. Puh-lease, I was going to be a champion AAC mum and would be talking to Harry in the PODD about ALL. OF. THE. THINGS. and ALL. OF. THE. TIME! Yep, no prizes for who was right. Hmm, it doesn’t’ fit in my bag. Oh okay, we’ll add a shoulder strap. (weeks pass) Good, the shoulder strap definitely helps. I’m just popping into the shop, we’ll leave it in the car. Hmm, that would have been a good opportunity for communication, wish I had the PODD with me. Me: Did you bring the PODD? J: No, I thought you brought it. J: Did you bring the PODD? Me: No, I thought you brought it. And sometimes I did have it with us, but I just didn’t feel like bringing it out. Maybe I was tired and not in the mood for modelling. Maybe I felt vulnerable and didn’t have the emotional strength that day to deal with people staring. And you know what, looking back, that was all okay (and sometimes, even now, still is) . What mattered is that we were on the path. We had a robust communication system for Harry and we were absolutely committed to ensuring that he would be able to communicate to anyone about anything, anywhere, any time. This time, we just had to give ourselves a chance. Hi, I am Anupama , I have a 2year old daughter with angelman syndrome and she is non verbal. We are ready to start PODD with our angel with basic minimum images. My question is how we can get access to a PODD book?? I don’t think I can afford iPad and software for now. We are working towards it. Is there any way I can get PODD book or used book.? It’s so encouraging to read PODD stories and its success with our non verbal kids. I hope we just get in right path. Hi there Anupama! That’s great to hear that you’re looking to start the PODD with your daughter, I hope you will all love it as much as we do. I can only suggest that you speak to a speech pathologist in your area who will hopefully be able to help you with accessing a PODD. You could also look on Facebook for some support groups as there is lots of knowledge and support on there. Dear Mum, you're doing enough.